When I realized (long ago) that I’ve only touched the tip of the iceberg when it comes to fishing, I began to improve as an angler. And I continue to learn every day. With an open mind, my skills have sharpened immensely over the years and my success rate has improved proportionately. PHOTO: Bob Parker of Sarasota found light fly-rod action a refreshing change. Although I have done quite well fly-fishing in salt water through the years, it’s the lakes and streams that continue to beckon back like a pleasant distant memory. There’s just something very alluring about a calm, warm morning on an uncrowded lake, river or creek. Perhaps it goes back to my early angling days when I targeted bluegill. There’s some truth to the belief that all (at least most) anglers cut their fishing teeth on these diminutive panfish. I remember standing on a creek bank in West Virginia with my grandfather, my eyes glued to the red-and-white bobber dancing on the surface. And though I’ve taken tarpon, snook, redfish, spotted seatrout, jack crevalle, dolphin, amberjack, kingfish, false albacore, barramundi, butterfly peacock bass, largemouth bass, rainbow trout, brown trout, walleye, coho salmon, steelhead, guapote, bonefish, permit and others on fly, it’s bluegill and other panfish that interest me most. If I’ve got a red-hot snook bite going on along the beach, I’ll gladly share that information with most anyone. If tailing redfish are hitting shrimp or crab imitations, I might even invite you along. But I’m very selective when it comes to sharing my bluegill spots with anyone. Why? I enjoy the solitude. Nothing soothes the nerves better than casting for panfish on a local lake. With saltwater species abundant and heavily targeted, our freshwater species virtually go ignored. So, catches of 100 or more fish per outing are fairly common. It wasn’t always that way, though. There were years when I’d head out on the water with a light fly rod and nothing but a box of popping bugs. Everything was fine as long as the topwater action was strong. But when it slowed, I was out of luck. I keep my eyes and ears open and my mouth shut when I’m around other anglers. Oh, I’ll contribute when I think I can add to the conversation. But I’m eager to pick up any tidbit of information that I think might help out on my next outing. That’s why fishing with Joe Bursel of Sarasota and Ron Whiteley of Rotonda has been so beneficial. Between the two, they have more than 100 years of experience – and most of it via the fly rod. So, when I found out both are fascinated by and often use micro-jigs on panfish, I took note. I ordered several packages of 1/129-ounce jigs and began tying various patterns. Taking this to its natural progression, I began experimenting with tiny trout patterns on local lakes. I’ve found that bluegill, shellcracker, channel catfish and largemouth bass could care less that the the micro jigs and tiny flies were designed for trout. PHOTO: This Lake Manatee shellcracker fell for a No. 12 nymph on a 2-weight fly rod. I still love to cast No. 12 poppers early in the day. It’s tough to beat a bluegill rising to slurp in one of your surface creations. And I’ll continue to cast poppers as long as the fish are willing to play.However, when that bite slows, I have a whole new arsenal on hand. And my new toys have resulted in steady action long after the fish begin ignoring popping bugs. PHOTO: Flies on No. 10, 12 and 14 hooks are the ticket to panfish success. My favorite fly right now is a gold bead ribbed Hare’s Ear on No. 10-14 hooks. I fish them about five feet below a strike indicator.A strike indicator is similar to a bobber. It’s a tad small and used to detect minute bites. I learned while fishing northeast Georgia trout streams that you need to set the hook whenever you even think the strike indicator does something out of the ordinary. On some occasions, the indicator might dip below the surface like a bobber. On other occasions, it might twitch. It might dart a fraction of an inch. It might not move at all. When your slowly working the fly and the indicator doesn’t move, set the hook! Your retrieve can vary. Most of the time, I like to make my cast, allow the fly to sink for a few seconds, then begin retrieving in erratic slow, short strips. Two tugs and a pause have worked well for me. And it’s usually on the pause that the fish hit. Recently, club members Tony Saviano of Bradenton, Bob Parker of Sarasota and Kevin Cooke of Venice joined me on different outings. And each time the fish were hungry and cooperative. All did well on bluegill and other panfish, but Cooke hooked a nice channel catfish on a No. 10 Wooly Bugger. Channel cats, revered by freshwater aficionados, not only will take flies, but sometimes will do so often. Most of the time, I’m using a 2-weight fly rod, floating line and a 7 ½-foot knotless leader with 5X tippet. You’d think that a sinktip line would be great for this type of fishing, and maybe it is for some. But for me, a strike indicator is paramount to my success. So, it’s floating line for now. Rest assured that if some savvy angler comes along and spouts tales of impressive catches on 300-grain lines and hot pink worms, I’ll give it a try. After all, why discount anyone’s experience on the water? Just doesn’t make sense. By the way, I’m just kidding about not sharing my freshwater spots. If any Mangrove Coast Fly Fishers’ members want to test out freshwater fly fishing, just drop me an email at steve@kayakfishingsarasota.com or give me a call at 284-3406. The trip is on me. I’ll supply kayaks, safety equipment and even fly rods if you’d don’t have anything small enough. And, oh, yes, I’ve got the flies, too. Pine Island Sound is 75 miles south and worlds away from Sarasota. 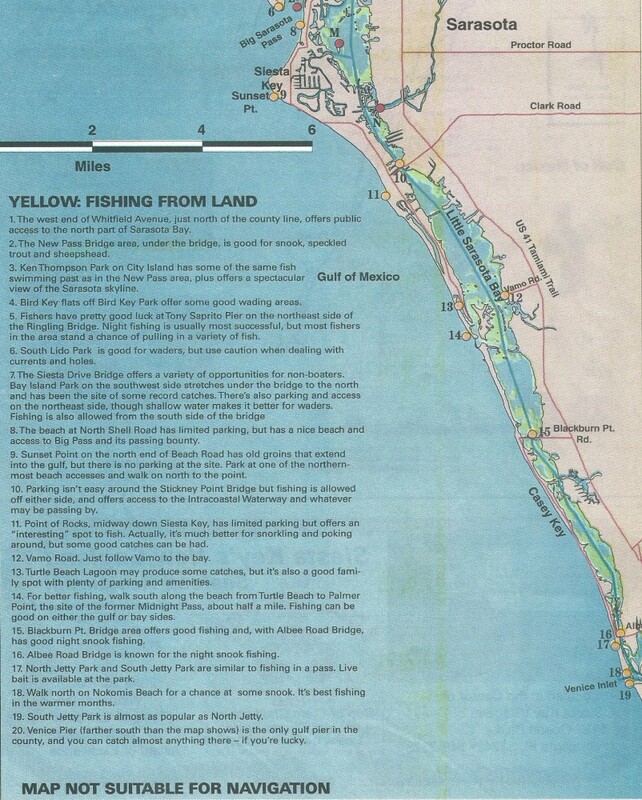 The Sound is home to tarpon, snook, redfish, spotted seatrout, flounder, mangrove snapper, cobia, tripletail, sharks, ladyfish, jack crevalle and many other species. It’s one of my favorite areas to fish – especially whenever there’s a negative low tide predicted. Because the area is full of lush grass flats, redfish there tend to tail year round, giving fly fishers a shot at great and exciting action. Even if you don’t hit the tide right, you’ll catch fish. Reds will cruise the grass flats or hang out in sand holes. Ditto for spotted seatrout and snook. In addition, there are many mangrove islands that hold good numbers of gamefish. It’s a great place for kayak anglers. There’s a good launch spot located just south of Pineland Marina, 13921 Waterfront Dr., Pineland. To get there from the Sarasota area, take Interstate 75 south to exit 143. Had west on State Road 78, then take a right on State Road 767 in Pine Island Center. Three miles down, take a left on Pineland Road. This will turn into Waterfront Drive and you’ll see a small historical marker/site on your left just south of the marina. The site has room for about six vehicles, so get there early on a weekend. I usually paddle south to Cat Key early in the day. If it’s not going on there, I’ll paddle about ¼ mile west to Ray Key. That’s where Will Huibregste and Dave Biber of Zionsville, Ind., had a good outing. It wasn’t going on at Cat Key, so we paddled to Rat Key. Biber missed a tarpon on a Rapala Skitter Walk after a spectacular blowup. He then landed a 30-inch redfish. Huibregste opened up with a 25-inch snook. The duo then caught and released another 24 snook to 25 inches. When the sun got up high, they drifted across the grass flat just north of the keys and caught nine redfish and 15 spotted seatrout from sand holes. It’s a very good area for fly fishing. On a solo trip down there last September, I managed 25 mangrove snapper to 16 inches, 12 spotted seatrout to 24, ladyfish and a 3-pound pompano. All were taken on 6-weight fly rod, intermediate sinktip line and chartreuse-and-white Clouser Deep Minnow. Two days later, I took a fly fisher from Apollo Beach. Our plan was to fish the sand holes that had been so productive on the previous trip. By noon, we only had three fish between us. We began to explore and found a hidden bay that was holding good numbers of snook. When I paddled into the bay, I would see snook busting glass minnows against the mangroves. I anchored between three ambush points and waited. When the water erupted, I cast a Gartside Gurgler into the fray and began to retrieve it quickly. Boom! In two hours, my client caught 24 snook to 27 inches. Pine Island is located in Lee County and is the largest island in the sound at 17 miles long and 2 miles wide. Pine Island is very secluded and has a rustic charm. Much of the shoreline is lined with mangrovs, providing excellent habitat for many species of fish. Pine Island has escaped the concrete, blacktop and skyscrapers found in other tourist communities. Current legislation prohibits high density, high-rise development in the foreseeable future. Sure, it’s a 75-mile drive. But who cares when you’re catching fish and having fun? No. 1: A happy fly-fisher with a Pine Island Sound snook. No. 2: Bent rods and singing drags are common in Pine Island Sound. No. 3: Dave Biber, left, and Will Huibregste, both of Zionsville, Ind., found Pine Island Sound to their delight. Emerson Point Park is a popular destination for local fishermen of all types, and you’ll find plenty of company there on weekends. There are countless opportunities there for the fly fisher, particularly if you don’t mind getting wet. Drive to the parking area at the point of the island and follow one of the paths back along the water’s edge on the north side. Walk ‘til you find a suitable place to ease yourself into the brine. Check the tide before you go, as moving water is always best, and, as always, be wary of deep spots. Perhaps the best method of fishing the north side of Emerson Point is to launch your kayak from the canoe/kayak launch, located on the right side of the access road half way into the park. It’s a good, well-marked launching place, off a dock built for the purpose. After a short paddle through the access channels, you’ll find yourself in open waters at the southwest edge of Terra Ceia bay. From here, the choice is yours. Paddle carefully over these massive flats and you’ll find yourself sneaking up on good trout and snook opportunities as you pass potholes or fish the mangrove edges. There are reds here too, but I find them easy to spook: I’ve perfected a casting technique that lets me observe nature at its best as the wakes of good fish head off in all directions following my presentations. The trout and snook are, for me, more forgiving. Anchor up and cast to a good spot (or to sighted fish!) or paddle to a good flat, get out of the boatand wade. Again, check the tide before you go and look to set up in places with good flow over structure. 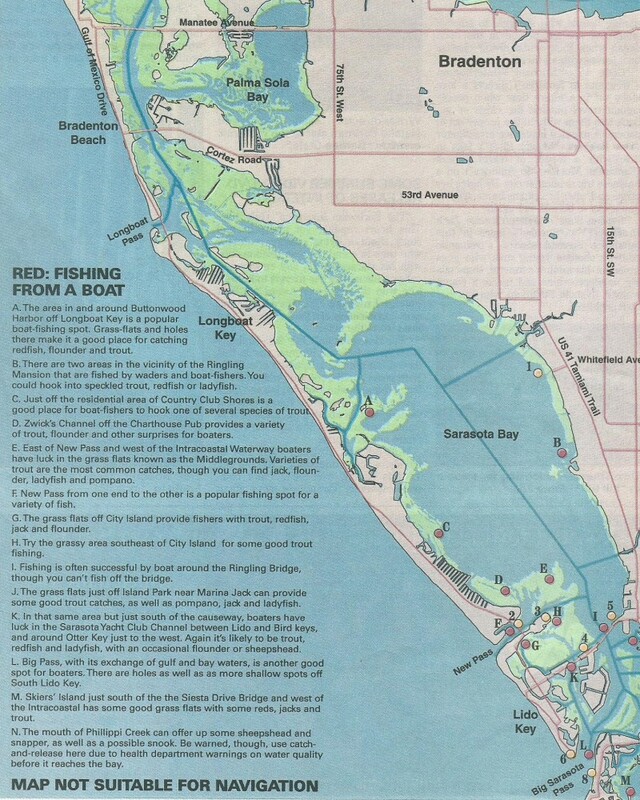 Emerson Point Park is located at the western end of Snead Island in Manatee County. To get there, take one of the major N/S routes north across the Manatee River, then follow 10th Street west through Palmetto. Watch for good signage that will direct you to the park.